True North is a direction along the Earth's surface that points to the North Pole. It is marked in the skies by North Celestial Pole, which is 1 degree of Polaris. From the Earth, North Celestial Pole appears to make a tiny circle in the sky each day. Due to the change in the Earth's rotational orientation over the years, True North rotates in an arc with respect to the stars. This rotation takes 25,000 years. What is your True North? 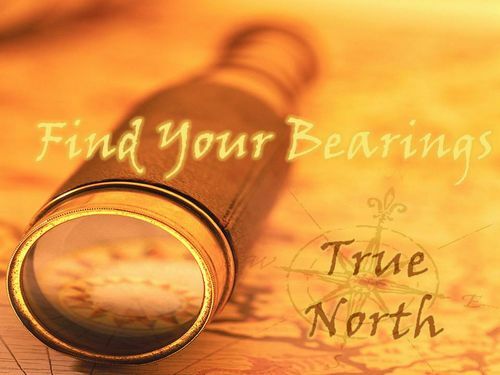 Finding our bearings, looking for something to guide us, is what finding your true north is all about. Many are in a place where we are searching. Searching for meaning...meaning in relationships, meaning in our workplace, meaning in our life. What are you doing with your life? Is it something that brings you joy...satisfaction...a feeling of completeness? Do you feel like you can create...grow...make an impact? What are you willing to sacrifice so that you can do these things...relationships...family...friends? Some think that finding direction is about winning...winning at our life. For every place where there is a winner, there must be a loser, of sorts. Are you willing to win at all costs? Even if that means someone you care about might lose? Are you willing to sacrifice someone you don't know? Where is the line? Are we willing to give up our soul to get ahead...our peace...our happiness? The actual True North rotates in an arc that takes 25,000 years to complete. Are we willing to sacrifice for our entire lifetime to say that we have won? Are we willing to sacrifice someone else's? I am at a time in my life where I am seeking my True North...my bearings. Where do I go...what direction? What do I want to accomplish? When I look back on my life, what do I want to see? Will I be comfortable seeing if I was willing to throw others into a crevasse so that I could get ahead? Do I wait for those at the back of the pack to catch up? Do I run ahead? Do I leave others behind? What will my True North look like? Right now I feel that I am in a time where I may have lost my bearings...I am in a blizzard, hunkered down in a lean-to. The cord that kept me attached to my group has somehow been broken and they are lost. I am hoping that the snow will lift and the wind die down so we can see the path we were on together...find each other again. There was a time when we traveled together, working as a group, feeling the bond. I don't want to travel alone...I feel safer in groups, stronger. I know that I am able to make the journey alone, but when I arrive at the destination, who will be there to celebrate my epic win? My win will be someone else's loss and I don't want to sacrifice others just to get ahead. As I sit, waiting for the storm to die down I wonder if there are others lost in this storm? Are they cold? Do they have enough food? I am worried...will they have the strength to wait out the storm or be swept into it? Sometimes it is easier to let go...crushing their dreams, but I am hoping that they can stay strong...wait for the storm to pass. Finding True North doesn't mean that you sacrifice all things, that you throw out the baby with the bathwater. Finding your True North means that we are looking for the signs that lead down the path where you can find your true self. When the storm lifts, I am hoping that I see the stars shining off a village of lean-to's, littering the new fallen snow. If we all come together, bringing our supplies, and finding our bearings, we can make the final legs of the journey together towards True North. Together...we can truly have our epic win.